The walk through Nine Dragon Vale to the Big Red Robe mother tree has tea bushes growing in every spare space. Growing out of a small walled area on this cliff in Nine Dragon Vale is the Big Red Robe mother tree, and, to the left, two of her sisters. After paying homage to the mother tree, climb nearby Mount Wuyi’s Tianyou Peak, and afterwards, float down the Nine Bend River on a bamboo raft. 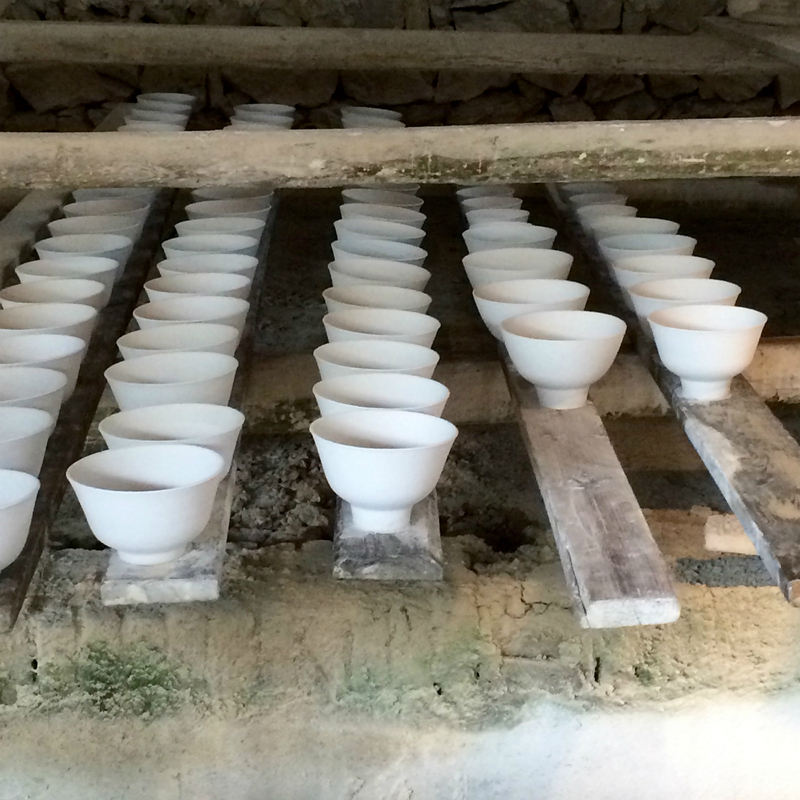 In nearby Jiangxi province, see how the world’s best porcelain—Jindezhen porcelain—is created by hand. 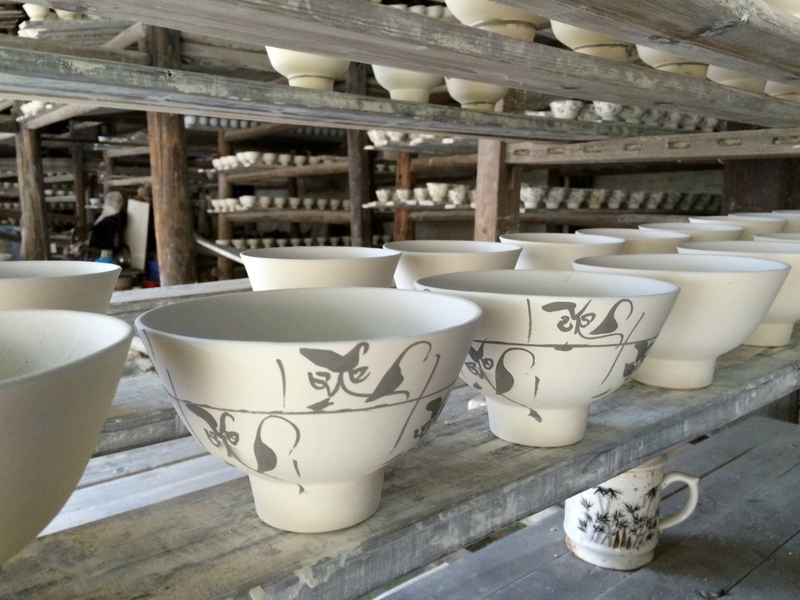 Handmade Jingdezhen porcelain ready to be fired in the kiln. 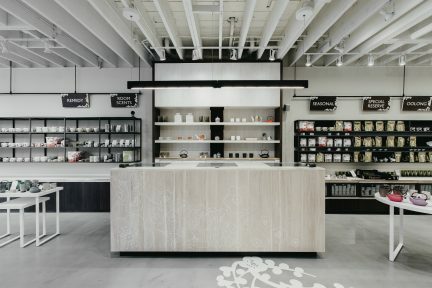 Sample exquisite teas in a tea salon. It is a sign of respect to fill one’s cup to just 70 per cent. 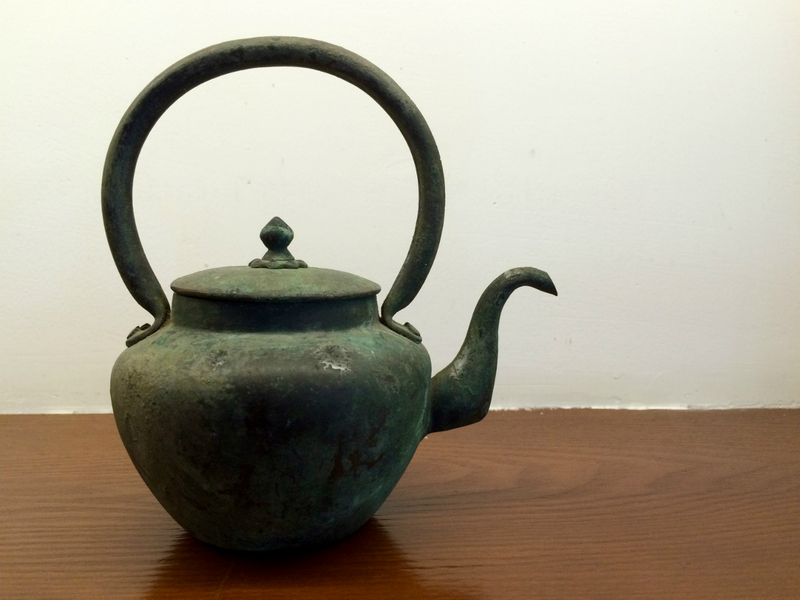 Elegant ancient tea pots are on display at the best tea salons and shops. 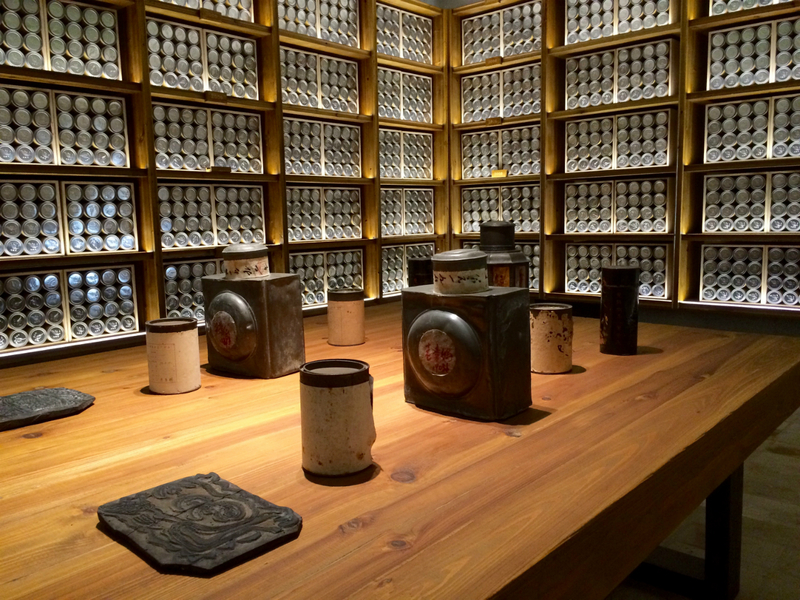 Inside each wooden crate, tea is packaged into metal tins. Like wine, tea can be selected by both type and year. 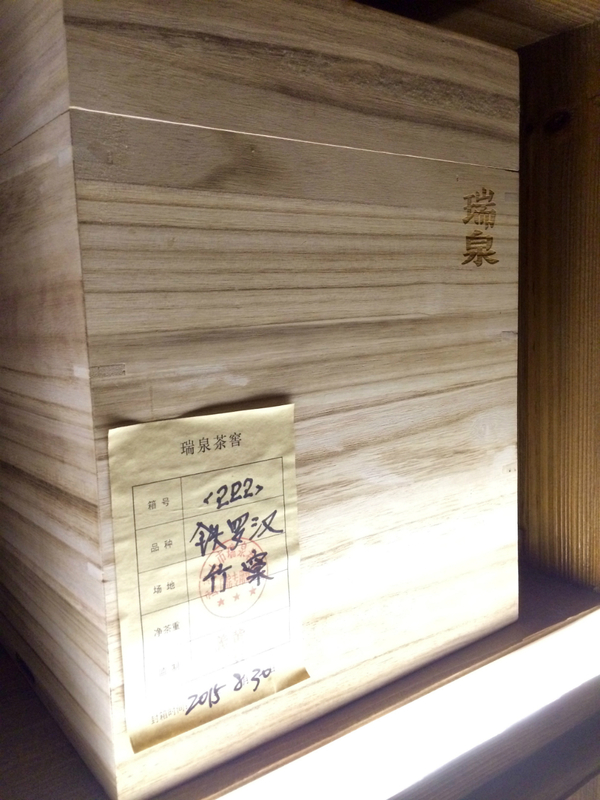 The best quality teas are stored in wooden boxes for protection. Richard Nixon was supposedly very upset. The first American president to visit the People’s Republic of China thought he was being snubbed. Chairman Mao Zedong had given President Nixon a welcome gift of tea; the story goes that Nixon was insulted by receiving “just” tea, and by such a small quantity at that. China Premier Zhou Enlai had to take the president aside to prevent a diplomatic crisis, explaining that the box was not only half the country’s supply of its most treasured tea, but was worth $200,000 US (over $1 million in 2016). Placated, Nixon continued his visit, and soon the outside world came to know about the King of Teas. All visitors to China drink a lot of tea, but they will need to go out of their way—and save up—for the really good stuff. The King of Teas is an oolong called Da Hong Pao, translated as Big Red Robe. Assuming you can find it, the original tea costs over 30 times its weight in gold, or almost $1,400 US per gram. It is grown in Fujian, a province in the southeastern part of China across the strait from the island of Taiwan. 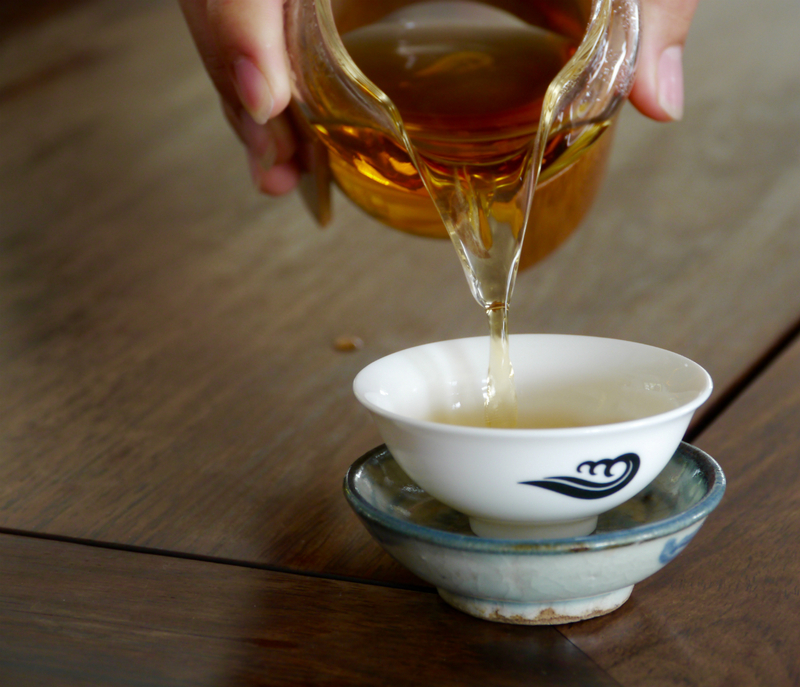 Fujian is a province mostly unknown to international tourists, except those in the know about tea. 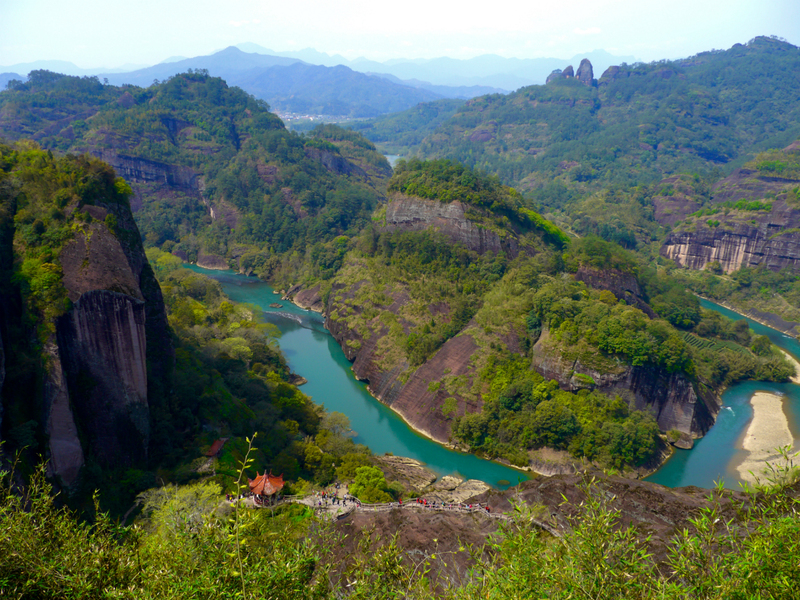 Its mountains and subtropical climate make it one of the world’s most important tea-producing regions, as well as a beautiful place for hiking in the north’s Mount Wuyi, a UNESCO World Heritage Site. 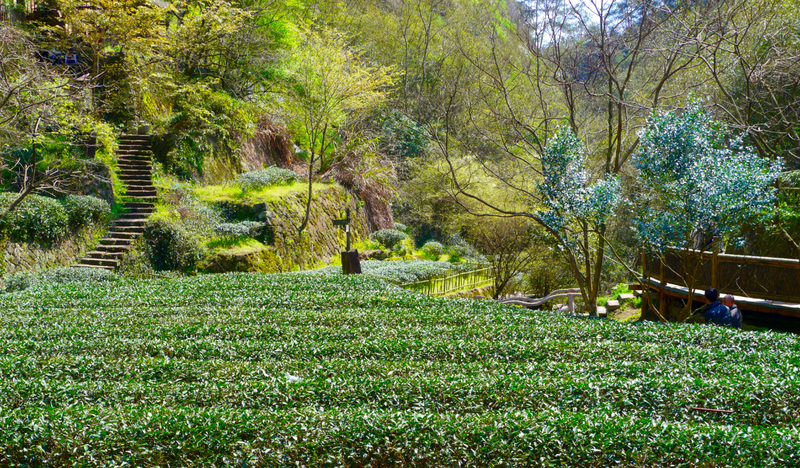 The Wuyi Mountains grow the highest-quality teas including the smoky Bohea—thrown into Boston Harbour during the Boston Tea Party—and the Big Red Robe. Tea aficionados come to the Wuyi Mountains to get steeped in the art of the drink, and to see the original Big Red Robe tree, last harvested in 2005. 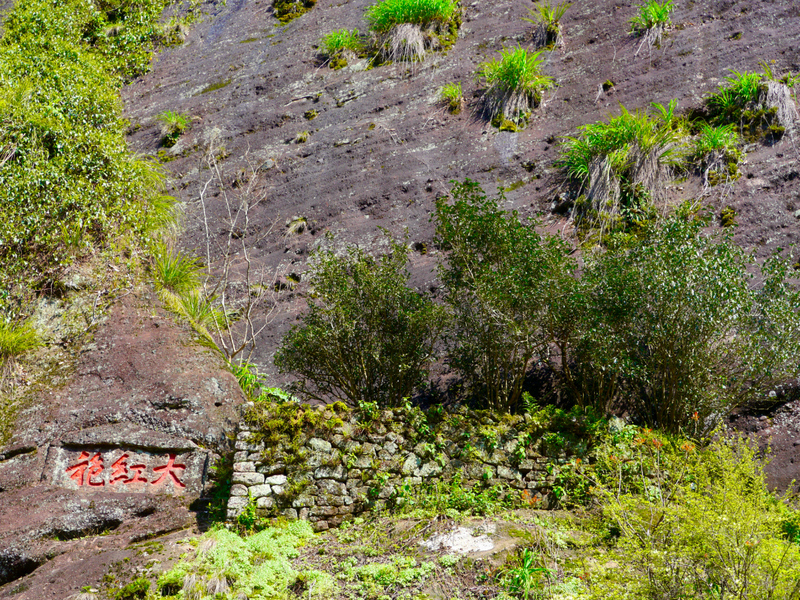 Walking down a winding path edged with rows of tea bushes in Nine Dragon Vale, visitors find the scrawny mother tree growing out of an almost vertical wall in the national park. The untrained eye wouldn’t notice it at all, except for the red Chinese symbols carved into the stone beside it, and the domestic tourists posing for photos with it in the background. 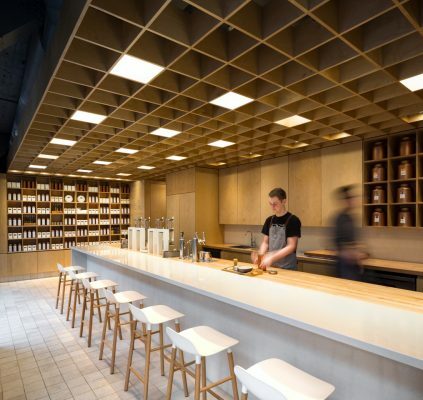 Some say the tea has grown here since the Song Dynasty (960-­1279); the mother tree would have looked much nobler when the tea was named back in the Qing Dynasty (1644-­1912). According to local legend, it got its name because of a student who was travelling through the area on his way to Beijing for a very important examination. Poor, he had little food for his journey and fainted when passing through the mountains. A monk gave him a cup of tea, which restored his health. The student was then able to not only complete his travels to Beijing, but was also very successful in his exams, which provided him with an important position in the government. He did so well in his career that the emperor awarded him a big red robe, a wearable honour so everyone could see his status. The student never forgot the monk and his gift of tea. He eventually made his way back to the Wuyi Mountains to give thanks by draping his honourable robe around the original tree. Getting one’s lips on a cup of the best quality Big Red Robe is difficult, even in Fujian province. Most of the limited supply is allocated to China’s president to offer to his prestigious guests, though it has been sold at auction a few times. To increase production over the centuries, clippings have been taken to propagate into new bushes. While still excellent, the quality of tea from the second generation bush is said to be only 95 per cent as high as from the mother tree, and the price and level decrease from there. Travellers can sample exquisite teas and learn how leaves are processed at select salons in the Wuyu Mountains. Only 10 Wuyishan City tea masters remain who know how to make Big Red Robe using the old techniques, including hand-rolling the leaves into the shape of a black dragon (an “oo long”) to dry. In Jingdezhen, China’s porcelain capital in next door Jiangxi province, tourists can visit a studio to learn how a proper china tea cup is made of Jindezhen porcelain. After all, the world’s best tea should be sipped from the world’s best porcelain. Those lucky enough to sample Big Red Robe should fill their cups just 70 per cent, and tap their fingers three times on the table to thank their tea server. The pattern of raps can also be a sign of gratitude towards the ancient monk and student, and even to Nixon, for bringing us the King of Teas. Read more from our Travel section. 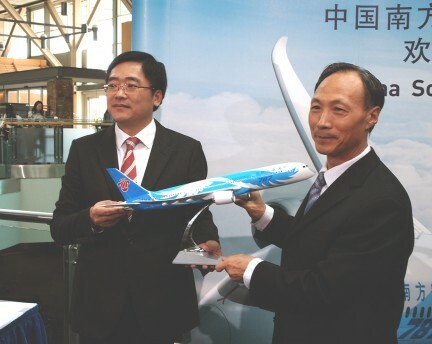 China Southern Airline's Boeing 787.